The way we date now often feels like we’ve completely bulldozed the magic right out of dating. We’re all in need of a throwback to the kind of old school charm and romance that existed before swiping and winking. Here are 5 dating rules that we need to bring back ASAP, which will help you find your way to one of the good ones online. Enough with the mind games and playing it cool. If someone is truly interested in you, they’ll tell you. If you’re not sure, just ask them and listen carefully to how they respond. Good dating should be all about being completely open and honest, and doing all that you can to show someone how interested you are in them. If he’s looking for a committed relationship, his actions will match this and he’ll be upfront with you all the way. Keep the bar high, listen to your intuition, and only continue to date someone who makes it feel like dating isn’t hard work – because it’s not supposed to be! For an added bonus, try a dating site aimed at serious singles, like Zoosk​​. When you start dating from a pool of singles who are looking for the same things you are, online dating becomes an entirely different experience. The double edged sword of online dating - more access to singles, but also more competition - leads many singles to fib the truth a bit in an effort to stand out. Four of the most common “white” lies on dating sites (height, weight, body type and using dated profile photos) concern appearance. Try joining a dating site which allows for something more substantive than a brief bio and a few choice photos. Matches on Elite Singles, a dating site aimed at professional singles, are based on answers to an in-depth personality questionnaire, gauging everything from how outgoing you are to what makes you tick. It's less about swiping and more about smarter matching. If a guy is only into texting and doesn’t pluck up the courage to call you on the phone within a week of connecting online, that’s a red flag that he’s a lazy dater. Emojis have their use but it’s hard to get an initial reading without having an actual conversation, especially as you often won’t type out everything you want to say because it takes so long! Get him on the phone early on, and make sure texting isn’t your primary form of communication. If he doesn’t take you out on a proper date after the first initial meet up, move on. 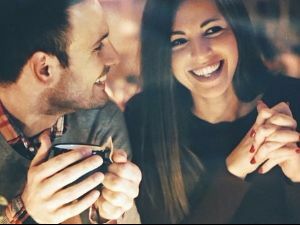 If he continues to suggest ‘hanging out’ or anything that involves coffee, Netflix, or copious amounts of alcohol, then he’s not serious about dating you. A guy who is serious will do everything in his power to impress you and treat you like a lady. If he suggests dinner, a picnic or a movie early on, you’re onto a winner! Don’t give away too much too quickly. A little bit of mystery goes a long way and besides, you have no idea who this person is yet or if you can trust them. Hooking up before you even know the other person’s last name really zaps all of the romance out of getting to know someone slowly, and letting those fireworks explode all in good time. If he’s rushing things at any point, ask him to slow down. If he does, take that as a sign that you mean something to him already. If he doesn’t, he’s not worth your time. Ready to take these tips to the online dating arena? Give Zoosk​ a try. Its' smart matching and ease of use just might be the key to making online dating work for you.